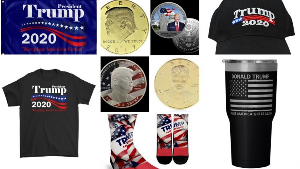 Prize: Ultimate Trump 2020 Bundle: Trump 2020 Flag; Trump 30oz Tumbler; Trump 2020 T-Shirt; (4) Trump Collectible Coins; Trump 2020 Cap; Trump For President Socks ($175). Statistics: This contest was opened by 108 and entered by 3 ContestChest.com members. 3% of those who opened the contest, entered it.